The combined collections of the Auburn University Libraries contain over 3.2 million volumes as well as 2.6 million government documents, 2.5 million microforms, and over 148,000 maps. 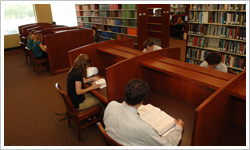 The Libraries receive over 35,000 current periodicals, many which are available online. The library also provides access to over 227 electronic databases and has over 10 million archival and manuscript items. The Ralph Brown Draughon Library is named in honor of Ralph Brown Draughon, president of Auburn University from 1947 to 1965, and a moving force behind the construction of the original portion of the Library. 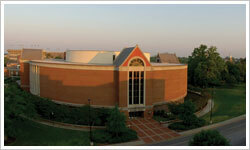 With the completion of a 207,000 square foot addition in 1991, the Library has a seating capacity of 2,500 designed to serve the study, teaching, and research needs of Auburn students, faculty, and staff. The Veterinary Medical Library provides services and collections which primarily support the teaching, clinical applications, and research of the College of Veterinary Medicine. Secondarily, the Library assists other Auburn University faculty, staff and students, especially in the fields of agriculture, biological sciences, home economics, nursing and pharmacy. Located in Dudley Hall Commons adjacent to the Graves Amphitheater at the end of Bibb Graves Drive, the Library of Architecture, Design and Construction houses a collection of materials covering architecture, interior design, building science, industrial design, landscape architecture, community planning, and art. The 35,000 volume collection complements but does not duplicate fine arts materials held in the RBD Library and includes over 85 current periodicals. The Special Collections & Archives Department of the Auburn University Libraries is located on the Ground Floor of Ralph Brown Draughon Library and houses published and unpublished materials which, because of their uniqueness or condition, require special care and handling. The Draughon Library is pleased to provide students with a newly established Learning Commons, a one-stop, flexible space configured to accommodate both individual study and group collaboration. The Miller Writing Center, Study Partners, Office of Information Technology Service Desk and library reference services are all conveniently located within the space. Library Policies can be found on the Library Policy page. To check for available faculty and staff positions in the Auburn Libraries, go to the Job Postings site. 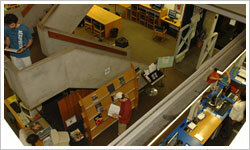 To check for available jobs in the Auburn Libraries, go to the Tiger Recruiting Link. Only students currently enrolled at Auburn University are eligible for student employment. Support for the Libraries starts with you. The generosity of our donors help to fund and can be tailored to mirror many interests. From supporting collection which support the college or school from which you graduated to the purchase of rare manuscripts to enrich our Special Collections, the Libraries has a place for you.